The What: Crestron's two new high-definition scalers, the Crestron HD-SCALER-HD-E (HDMI In, HDMI Out) and HD-SCALER-VGA-E (VGA In, HDMI Out) provide streamlined, application-specific HD scaling solutions. They deliver all the features and controls needed to display all AV sources correctly. Both automatically scale any input signal to match the native resolution of a display or other HDMI device. 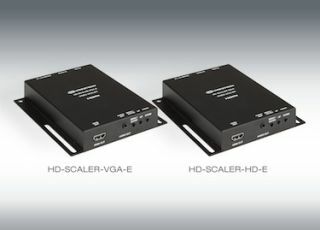 The What Else: The HD-SCALER-HD-E provides a single HDMI input and output, plus audio embedding and de-embedding. It enables you to display otherwise incompatible HDMI signals on HDMI displays, and upscale standard definition video to HD. For example, video conferencing codecs are notoriously finicky about accepting input signals. The HD-SCALER-HD-E solves the video conference codec input problem with a low cost, low power consumption, and compact device. It also includes analog audio input, and the ability to output analog audio and HDMI at the same time.